The other day I had cause to catch a train from Gardenvale to Balaclava. It’s interesting to compare these two stations. They are both elevated over main roads. Both have shopping centres that have built up around them. Both have connecting street-based public transport. Gardenvale station opened in 1906 as an additional station on the existing line, and appears to have its original ramps in place. These are narrow and steep, and definitely not DDA-compliant. Parts of the platform are also quite narrow. 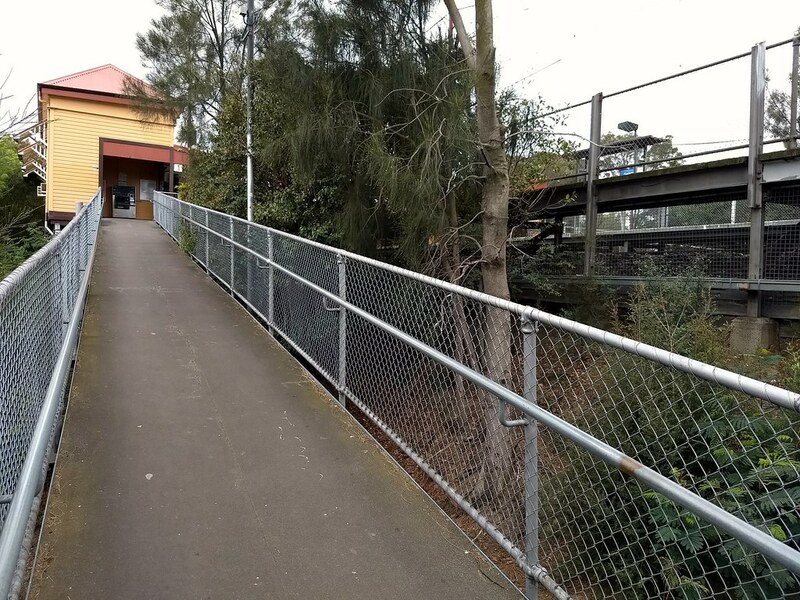 Apart from additional Myki readers on the outbound platform, it looks like no major works have been done here for many years, though the building on the citybound side was rebuilt following a fire in 2009. Balaclava is three stations north – this station opened in 1859, and like many streets of the streets in the area is named for the Crimean War. It was my nearest station for much of my childhood, and I remember the old ugly pebble-mix building well. But Balaclava has had major work done on it. Between 2012 and 2014, the entrances and buildings were entirely rebuilt, and parts of the platforms were widened. 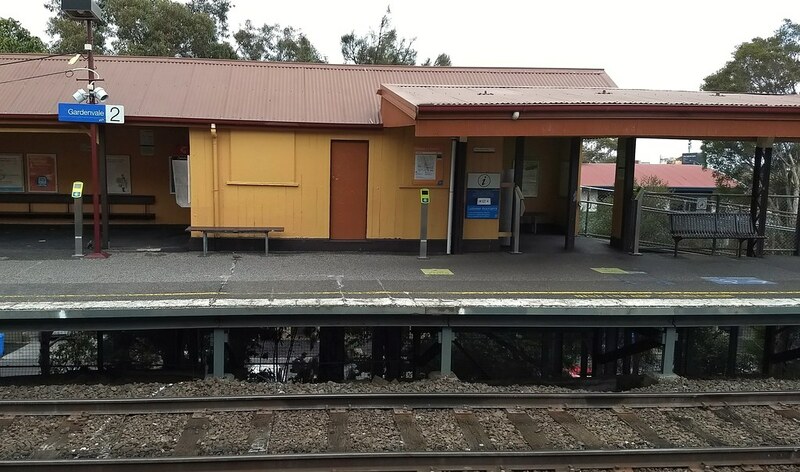 The station was upgraded to Premium (full-time staffed), filling a gap between full-time staffed stations, and there’s a coffee stand on the citybound side. The old entrance ramps were replaced by DDA-compliant ramps, and stairs, and there is provision for future lifts. Even better: the tram stop below the station has been upgraded since I was last here, with accessible stops. Unfortunately none of the trams on route 3/3a are low-floor, but some on route 16 are, benefiting those with prams, wheelchairs and luggage – as well as cutting stop dwell times. 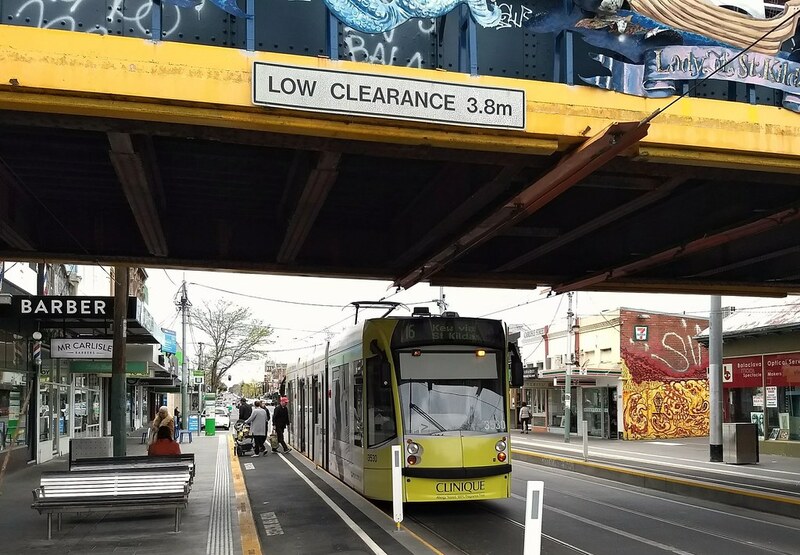 Over time, we can expect more low-floor trams to come into service. The bike lane along the platform is a nice touch too. It’s good to see Balaclava get this investment. 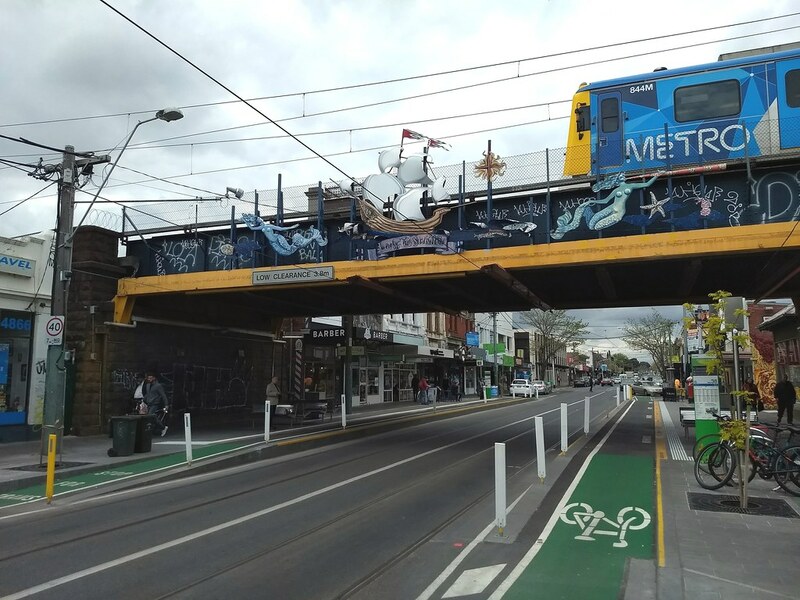 Apart from Prahran, it’s the line’s busiest station south of South Yarra, so access is important. Perhaps it’s hardly surprising that the line’s busiest stations are all in the inner section: they have the best connecting services (mostly tram), and serve higher-density (and most likely less car-dependent) neighbourhoods. Note that of the top five, apart from Elsternwick, none have any parking! So, Balaclava looks good. It’d be great to see similar upgrades at other stations around the network to achieve DDA-compliance, as we move towards a more accessible transport network. Gardenvale needs a huge upgrade similar to the one that happened with Balaclava. The gap between the train and platform is big and you have to leap down to reach the platform. For old people and disabled, the station is woefully inadequate and one woman in a wheelchair has fallen off. The station is dangerous for all commuters. The ramp and platform at Gardenvale reminds me of ye olde Laburnum. Speaking of dangerous, Auburn platform 3 is worthy of mention. The down end of the platform – right where wheelchairs and mobility scooters have to board – was extended around sixty years ago and is nearly a foot lower than the rest of the platform (which is of course built to the already low height designed for 19th century swing door trains), is incredibly narrow, and also has a huge gap between the train. It also looks like the back part of the platform had collapsed at one time and was simply fenced off with no effort made to rebuild it whatsoever, which is why it is so narrow. And yeah, the 16 really is special. 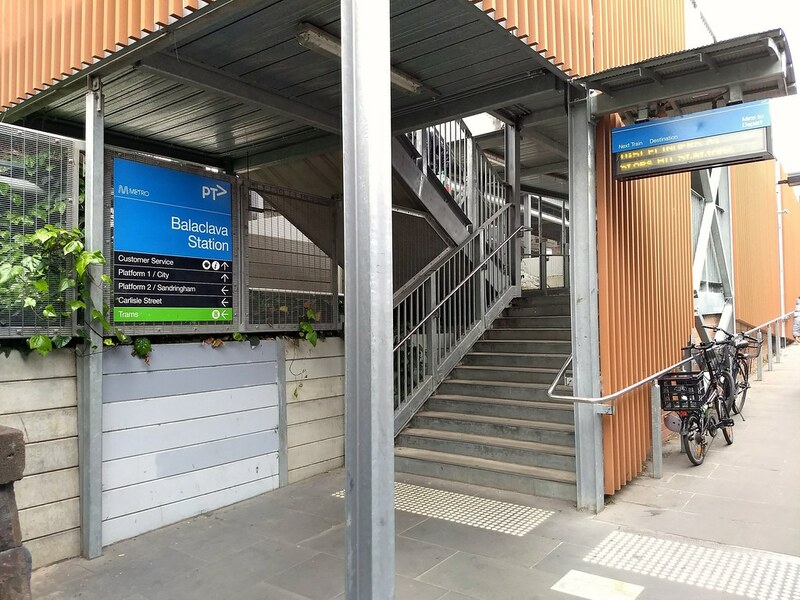 Balaclava station gets an accessible stop, but not Glenferrie or Malvern? 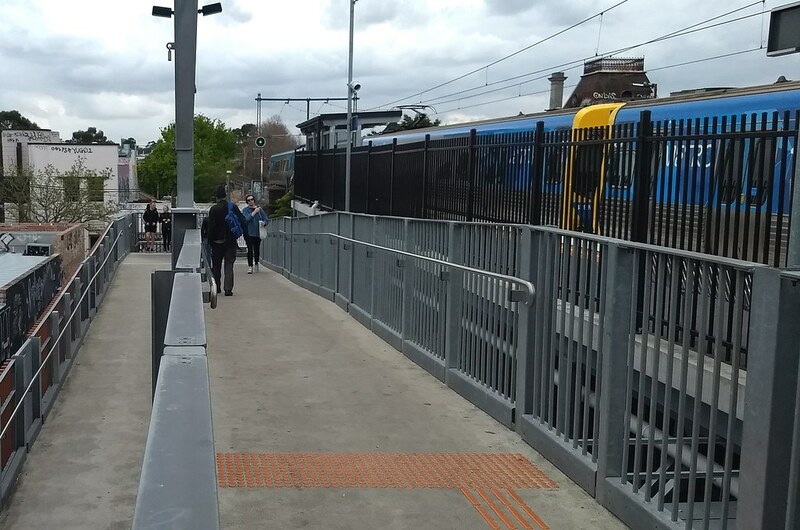 Windsor should get new entrances (one on each platform) at the Union St end of the station both to give the station a DDA compliant entrance on each platform (changing the existing ramps would be more expensive and have potential heritage issues) and expand the catchment (including towards St Kilda Rd). This might drive the Windsor patronage up past Elsternwick and even Balaclava. Balaclava is in the ultra marginal 3-way marginal Green held Prahran, while Gardenvale is in the safe Liberal seat of Brighton. Malvern, Kooyong (which should also be a priority for grade separation because of the trams) and Glenferrie are in safe Liberal seats. Aren’t all Sandringham line stations south of South Yarra? And were there protests about sky rail way back when? The brand new stainless steel benches are directly under where pigeons roost in the underside of the bridge. I wouldn’t recommend anyone sit there unless they’re holding an umbrella!